In this newsletter we offer some growing tips for asparagus crowns and strawberry plants, and also some fun facts and interesting history about them. So read on to learn a few things we bet you didn't know about these two culinary all-stars. Did you know there is an asparagus recipe dating back 1,600 years? That's right: back when Augustine was writing his Confessions in the late 4th and early 5th centuries, some unknown gourmand wrote down recipes that were preserved in the oldest surviving cookbook, the Apicius. That a chapter on asparagus was included is not surprising; asparagus had been cultivated for more than two millennia by the Greeks, and the Romans later brought it with them into the lands they conquered. From there, this unassuming member of the lily family spread all over the world. Asparagus dishes have always been popular because of their unique taste and texture, but we now know that asparagus is one of the most nutritious vegetables, loaded with folate, and an excellent source of Vitamins A, C, and K.
For the gardener, asparagus is most appealing because it remains productive for an extraordinarily long time: once it's producing, you'll be able to cut it every year for up to two decades! No other cut-and-come-again veggie can top that. Asparagus grows best in rich, well-drained soil that receives full sun. Before you plant your crowns, choose the location carefully because it's near to impossible to successfully transplant them later. Extension specialists such as Norm Myers, director of the Oceana County Extension, recommend that you test your soil before you plant so you'll know exactly how to amend it to create ideal growing conditions. As he explains, asparagus requires a high pH; 7 is ideal, or even a bit higher. Your local extension office can help you out with soil testing, or you can do it yourself by getting hold of a soil testing kit. To build up the pH of your soil, mix in lime, but start early because it takes time to turn acidic soil around. Mr. Myers also points out that asparagus grows best in sandy soil; if you have clay, plant on a hilltop or hillside. Enriching the soil with organic matter such as compost and manure is always a good idea, but, beyond that, let your soil test be your guide. Of course, many gardeners don't perform a soil test, and if you fit that description, know that asparagus generally needs a lot of potassium, but very little nitrogen, and it only needs significant phosphorus during the year that the crowns are set. For this reason we recommend adding phosphorous at the time of planting. Any high-phosphorus fertilizer can be used but triple superphosphate 0-45-0 is the most concentrated, and the form that is most readily absorbed. Later you can apply more compost and, if you think your soil needs further enrichment, use a high-potassium fertilizer. With its 3-4-6 profile, Espoma Tomato Tone works well for this purpose. The history of strawberries is as interesting as that of asparagus, though not quite as long. The ancient Greeks did not know of strawberries, but there is evidence that the Romans did, in fact, the poet Virgil, (70 to 19 BCE) issued a warning to children that when they go out to pick strawberries, they should beware of snakes in the grass. Madame Tallien, a legendary social figure in Paris at the time of Napoleon, bathed in the juice of fresh strawberries, using 22 pounds per bath. One wonders if she bathed alone: further folklore tells us that strawberries have often been used as an aphrodisiac. Surprisingly, Native Americans played an important role in the invention of strawberry shortcake. They were in the habit of crushing fresh strawberries into a cornmeal cake; when the Pilgrims tried to do something similar with their own shortbread, they hit on a desert we still delight in today. The name strawberry itself is very old, dating back to the streowberie or streawbergan of Middle English, words that suggest a berry whose runners are strewn along the ground. It's a name that proved especially apt, because when strawberries began to be cultivated around the time of the Renaissance, straw was commonly used to mulch thema practice that continues to this day. Like asparagus, strawberries like well-drained sandy soil and full sun. In this case, the ideal pH is 5.8 â€“ 6.2. In addition they need good air circulation, which is why some people plant their strawberry patch on a hill or other raised area. As with asparagus, it's a good idea to prepare the soil in advance. 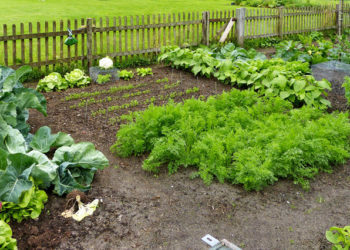 Remove any weeds and sod, mix in your compost, and then cover with black plastic until you're ready to plant. When you plant strawberries, pay special to depth. You want to place the crownthe fleshy portion of the plant between the top grown and the rootsinto the ground so that the middle is at soil level. Paul James of HDTV explains this and other planting procedures in depth in his article Growing Strawberries. Strawberries consistently need 1 â€“ 2 inches of water per week to produce truly juicy fruit, so be prepared to offer them that if you don't get much rain. Planting a row of Green Bean plants between every row of strawberries will produce bigger, more flavorful strawberries! That's all for now. 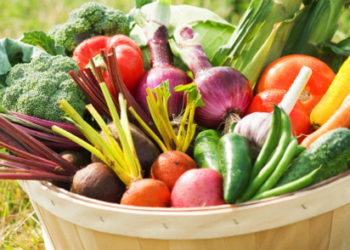 Happy planting from all of us at Garden Harvest Supply. I was wondering what to use on strawberries for insect damage. I have, on hand, a wettable sulphur powder, but strawberries were not mentioned on label at all. Any suggestions? Sandra, I would also say that Seven dust will also work, just keep in mind it is a chemical.